I know some weeks are busier than others and sometimes it just feels like there is no time to cook or prepare food for yourself at the end of a long day. Spending a few hours on a Sunday afternoon prepping some ingredients for meals can be a big time saver and leave you feeling less stressed about where your next meal is going to come from. Meal prepping not only saves you time but it also helps you stay on track with your nutrition goals. 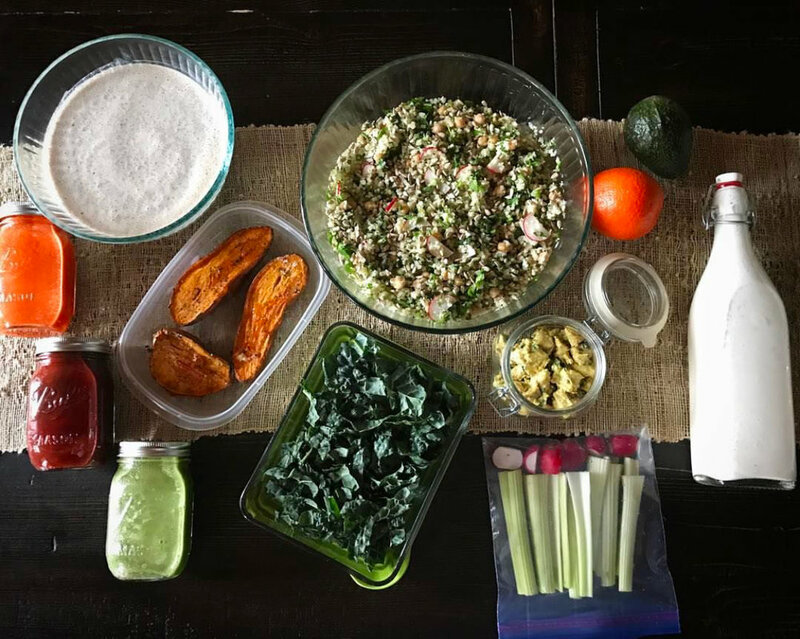 Here are a few tips to make meal prepping a breeze and set you up for a successful and healthy week. Going into a grocery store can be overwhelming for some, and a lot of the reason is because you don't have a plan. Before you head out for your weekly grocery haul, make some decisions about what you want to eat for the week and write a list of everything you need organized by sections of the grocery store (ex. produce, dry goods, meat/fish, canned goods etc.) This will hep you stay laser focused, save time and also help to avoid the temptation to buy unnecessary items that may eventually go to waste. If you are brand new to meal prepping, don't feel pressure to cook and prepare every meal you're going to eat for the whole week. This is a huge undertaking for a beginner, so instead maybe start with 3-4 meals that are most helpful for you to have ready to go. This could be something as simple as some to-go breakfast options or just getting into a routine of packing your own lunch so you're making healthier decisions while at work. Making a bigger dinner portion a few nights a week is a great idea because you can have the left overs the next day for lunch. This doesn't take any more time or thought to it and it really cuts down on food waste. Before you sit down to eat put a portion of your meal into a to-go container so you don't overeat at dinner time. Wash and chop your vegetables all at once when you get home from the store. This eliminates the need to bring out your cutting board every night at dinner time and do prep work. When the prep work is done ahead of time you can just get home in the evening and pop your meal in the oven. One thing I love to do is just make a big batch of roasted vegetables, whole grains, and protein and store them all in separate containers in my fridge. This way I have several options that I can mix and match into "protein bowls" or "veggie bowls" that make a complete meal. This allows for more variety in my meals and all the pre-made ingredients can hold in your fridge for a few days at a time. If you're someone who enjoys a green smoothie for breakfast in the morning its a great idea to make smoothie bags. You can put all your dry ingredients pre-measured into little baggies in the freezer so when it comes time to make them all you have to do is throw it in the blender and add some nut milk. This saves a lot of time in the morning and can easily be taken to go in a mason jar. Having healthy snacks on hand not only helps to stabilize your blood sugar during the day but it also eliminates the temptation to mindlessly grab junk food when you are hungry. Packing a variety of snacks to take with you for the week is a great way to make healthy choices during your busy days. Filling small baggies with mixed veggies, mixed nuts, or energy balls keeps you prepared when hunger strikes. If you're taking most of your meals on the go, invest in some good containers to transport your meals in. It's not only kids who need lunch bags anymore! I prefer glass tupperware and mason jars for all my food storage needs cause they are easier to clean, and I'm less likely to leave them somewhere on accident. If you are really short on time, or just hate the washing and chopping part of meal prep, then spend the extra money to buy the pre-cut items. Grocery stores are catching on that more and more people are looking for easier ways to eat healthy so they are doing half the work for you. I have even recently seen pre-made smoothie cups where you just have to add the liquid and blend, so It can't get much easier than that. While you will be paying a premium for pre-cut/pre-prepped items I guarantee you will still be spending less than you would if you just ate out everyday. While cooking can seem like a drag for some people, look at the bright side and pat yourself on the back just knowing you're making an effort to fuel yourself in a healthier way. Try new and simple recipes to mix it up and remember, start slow and build on your skills as you go along. Have fun with it! Congratulations to Diane for being this months client spotlight! I've been working with Diane for just over two years now and she has made great progress in both her strength and stability during our time together. Diane supplements her two training session/week with weekly yoga class and when the summer months come you can find her on the golf course several times a week. We work a lot on her strength and flexibility so she can crush the golf ball farther while also staying injury free. Diane has faced a lot of her fears in the gym and rises to the challenges I put in front of her, often times surprising herself with her capabilities. Congrats on all your hard work Diane, keep it up! One of my favorite recipes to add into my weekly meal prep is chia seed pudding. I love to make a big batch that I can take as a daytime snack or even eat for breakfast. It goes nicely with some berries on top and can be stored in little mason jars so it's an easy snack to take on the go. Enjoy! 1. Drain the water from the cashews and place them in the blender. Add all remaining ingredients (except for the chia seeds) in a blender and blend on high for 1-2 minutes or until it is fully blended together. 2. Place chia seeds in a large bowl and then pour the liquid over top and stir until there are no clumps of chia seeds. 3. Place in the fridge for at least 4 hours or overnight. The pudding should be thick when it's ready. 4. Divide into a few mason jars and top with berries or any other toppings of choice.